The Challenge: Champs vs. Pros will have 10 of American athletes go up against familiar Champion Challengers. Those cast members are not announced, but Vevmo rumors say it is Darrell, Bananas, Jordan, Nehemiah and Wes for the guys and Cara Maria, Veronica, Ashley K., Camila and someone else. 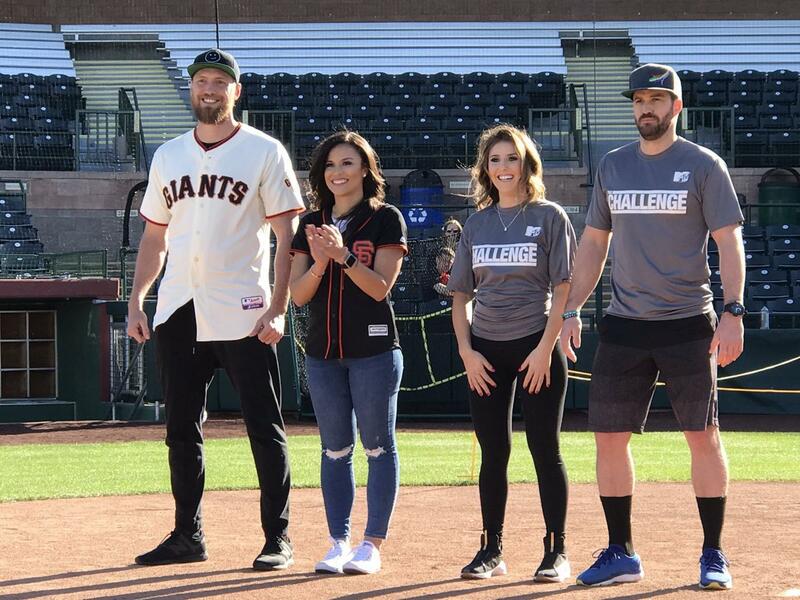 Champs vs Pros – Bananas and Camila with Hunter Pence and His Wife? NY Giants star and Challenge fan Victor Cruz will host the special six-week event, which premieres on Tuesday, May 16 at 9pm, after The Challenge: Invasion reunion at 8pm (according to MTV.com’s schedule for The Challenge: Invasion). Every week, the winning team’s captain will choose one member of their team to go into the elimination round, and the rest of the team will vote in their opponent. The losing team’s captain is automatically sent into elimination, and their team will also nominate their opponent. The final male and female competitors of the season will endure the ultimate test, showcasing each strength in one heart-pounding race for the chance to win $50,000 for their favorite charity. I’m sure the Challengers also get an appearance fee, since none of them have enough money to work exclusively for charity. No, none of the female pros are Bananas’s girlfriend snowboarder Hannah Teter. While we’d like to do a league, it will be tough to draft with so little time before officially knowing who the competitors are and the show debuting. Any ideas how we can make this work? Comment below.